by Serway, Raymond A., Jewett, John W.
Comments: ALTERNATE EDITION: ***THIS IS A LOOSE-LEAF CUSTOM EDITION TEXTBOOK! THE SAME CONTENT JUST CHEAPER! *** Book in 'Acceptable' condition. Will show clear signs of use with water damage to pages and worn, bent or torn covers. 2nd day shipping offered. Ships same or next day!!! Used books may not contain supplements such as access codes or CD's. We have the best customer service online!This is the U.S. student edition as pictured unless otherwise stated. Comments: ***PLEASE NOTE*** This book is in Good Condition, has little wear, writing & highlighting. ***Regardless of title, CD/DVD/Access Codes or Supplemental Materials are not guarantteed. *** This is a U.S. Student Edition Book. This book is not a rental. 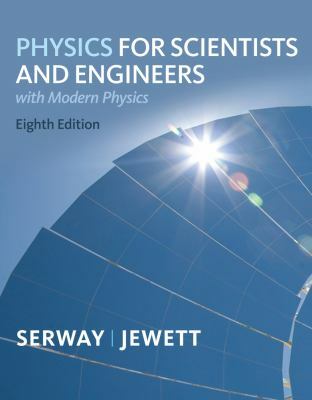 Serway, Raymond A., Jewett, John W.
Cengage Learning published this textbook in 2009 and you now have the chance to buy the cheapest copies of Physics for Scientists and Engineers with Modern, Chapters 1-46. Used books are the best way to get a discounted deal, so buy Physics for Scientists and Engineers with Modern, Chapters 1-46 online today. Written by Raymond A Serway and John W Jewett, this book was published in this 8th edition in that year, and it will give you the best opportunity to learn more about how physics applies in these particular positions. You will learn far more than you ever thought was possible. Serway, Raymond A. is the author of 'Physics for Scientists and Engineers with Modern, Chapters 1-46', published 2009 under ISBN 9781439048443 and ISBN 1439048444. Loading marketplace prices 23 copies from $20.59 How does the rental process work?